I've been in and around music all of my nearly six decades of existence. I used to love to spend my free time casually thumbing through the rows and racks of LPs in record stores and even found desperation-fueled, short-term employment in a few of those lovely establishments back in the 70s. 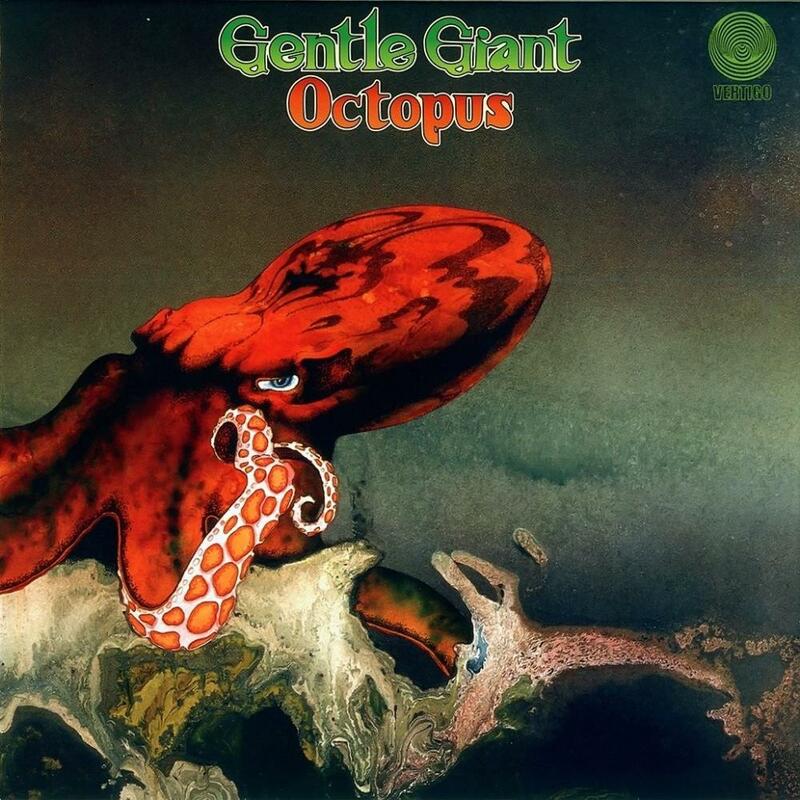 So how I missed hearing even a solitary note from a band as interesting as Gentle Giant for so long is a mystery to me. But sometimes if a group or a particular album isn't recommended to me by someone whose taste I trust, I can easily remain oblivious to them or it. There's just too much music out there to get around to it all and, in this case, radio was no help. Even the most liberal of FM stations in the southwestern US were hesitant to go near this kind of material. Thanks to this website, however, I can happily say better late than never. I have finally discovered GG. It is indeed a rare occurrence when I must confess that words are failing me, but as I was jotting down notes during a recent spin of "Octopus" I realized that I was being confronted with sound manipulations that are darn near indescribable. This music is so unique, so novel that I'm afraid my review will be irritatingly circumlocutory instead of direct. For that I apologize in advance. I can only say I'll do my best to convince prog explorers that this is music for those of you who love to experience something wholly different from the norm. Who admire aural art that comes straight out of left field. Who appreciate challenging compositions and arrangements loaded with substance and forethought, not just weirdness for weirdness' sake. If that's you then this album is right up your alley and you'll be glad you found it. Nothing could have prepared me for "The Advent of Panurge" so all I can do is relate my reactions. It starts with some kind of a medieval madrigal chorale singing over electric piano, then the band blows in like some abstract Dali sandstorm filling up the sky. Soon trumpets blare briefly and a semi- psychedelic moment flies across before they return to the madrigal vocals, followed by what I can only describe as a sort of powerful, crawling musical reptilian force taking over until the end. (I tried to warn you.) The lyrics aren't as obtuse as the music but they aren't your regular moon-in-June flavor, either. It's about Pantagruel discovering a lifelong companion in someone who goes by the name of Panurge. Or something along those lines. Here's another revelation. "Octopus" is reminiscent of the first time I heard Frank Zappa. That was akin to being introduced to gas music from Mars except that it somehow made sense to me and it was a wonderful, exhilarating feeling. And hearing "Raconteur Troubadour" for the first time was similar in that it was a totally unique listening experience with its rapid-fire musical episodes causing my head to swim in an effort to keep up. Just when I think I've got my hands on this slippery fish a grandiose processional-style melody comes parading into the room to my delight. It seems there's a surprise lurking around every twisting turn and soon they reprise the bizarre melodic theme, ending with an electric piano riff retarding like a wind-up toy coming to rest. The tune's words describe the life of a traveling minstrel but who has time to pay close attention to the lyrics when the music is making your mind swirl like a carnival ride? "A Cry for Everyone" is yet another fun brain-stretcher. It's a forceful rocker (these boys have backbone aplenty) that features a marvelous kaleidoscope of musical instrumentation including some arresting synthesizer settings (especially for 1972). One of the many admirable traits this group possesses is their ability to never let the gourmet fare get overdone. However, when exciting movements like the conga-led sonic tour-de-force that rises up towards the end of this song come along I selfishly want them to go on and on. They're that cool. The words are somewhat deep and philosophical but they have no sobering effect on the unbridled enthusiasm of the band's performance here. "Knots" sounds like an experiment but it's a successful one nonetheless. It is indeed strange and alien to my ears but the complex counterpoint they indulge in is captivating. About the time I think I've heard it all John Weathers comes out of nowhere and turns in a blistering solo on the xylophone that leaves me shaking my head. Speaking of John, don't overlook the incredible drum work he provides throughout this album because there's nothing about it that could be called easy. And no, I don't have a clue what the subliminal phrases they're singing mean so don't ask me. I'm just enjoying the ride. Leave my tender psyche out of this. After a clever coin-toss introduction, the instrumental that is "The Boys in the Band" ensues and it's a high-spirited conglomeration of fast-moving, ever-changing musical ideas that are very Zappa-like in their intricate intensity without ever sounding like a rip-off of that genius' magic. On this track everything compliments everything else in a way that I never thought possible. "Dog's Life," a humorous tribute to their road crew, is a drumless exposition of folk instrumentation mixed up with modern eclectic jazz influences that works brilliantly. (Yikes. I'm running out of complimentary adjectives already.) All I can say is that I hear something new every time I spin this ditty. This is music for the mind. The quieter "Think of Me With Kindness" is absolutely beautiful in its relative simplicity yet it isn't a simple song at all. Confused? What I mean is that it goes places I don't expect it to go to but once I'm there it makes all the sense in the world. Having said that, it ends in a classic, grand symphonic prog way that melts my heart almost as much as the emotional, heartbreaking words about lost love do. "River" is the closer and it's a return to more of a hard rock stance for the "verse" (the standard verse/chorus patterns don't really apply to these guys, though), then a floating-on-a-cloud sequence drifts through before a barrage of tasteful drum breaks intervene. All this leads up to an unbelievably authentic British blues guitar solo that Clapton would be proud of. Not what I was expecting to hear at this juncture but true to the unpredictable nature of this group's offerings, for sure. A reprise of the initial odd vocal melody is next, followed by a definitive ending. The lyrics comparing music to a flowing stream of water are poetic and meaningful. Looking back on this vague review I can report that I merely failed to describe the indescribable and I reckon there's no shame in that. The bottom line is that this music involves me, intrigues me and makes me smile and that's all I dare ask for. I don't know if their other albums are as amazing as this one but I plan to collect a few more and find out before they go out of print. I can't say enough about the astounding vocal and performing abilities of the brothers Shulman (Raymond, Derek and Philip). There are so many varied instruments darting in and out of these tracks that I can't keep up. The keyboard work of Kerry Minnear is nothing short of phenomenal and Gary Green's guitar playing is impressive, to say the least. I can see where this sort of musical collage that sometimes borders on dissonance and abstraction-by-design might not be everyone's cup o' tea but that's what sets these guys apart from the herd. I, for one, am hooked on this album and I know without a doubt that it will continue to entertain and amuse my insatiable desire for adventure for many years to come. I also now know why the fans of Gentle Giant are so loyal. This is greatness.